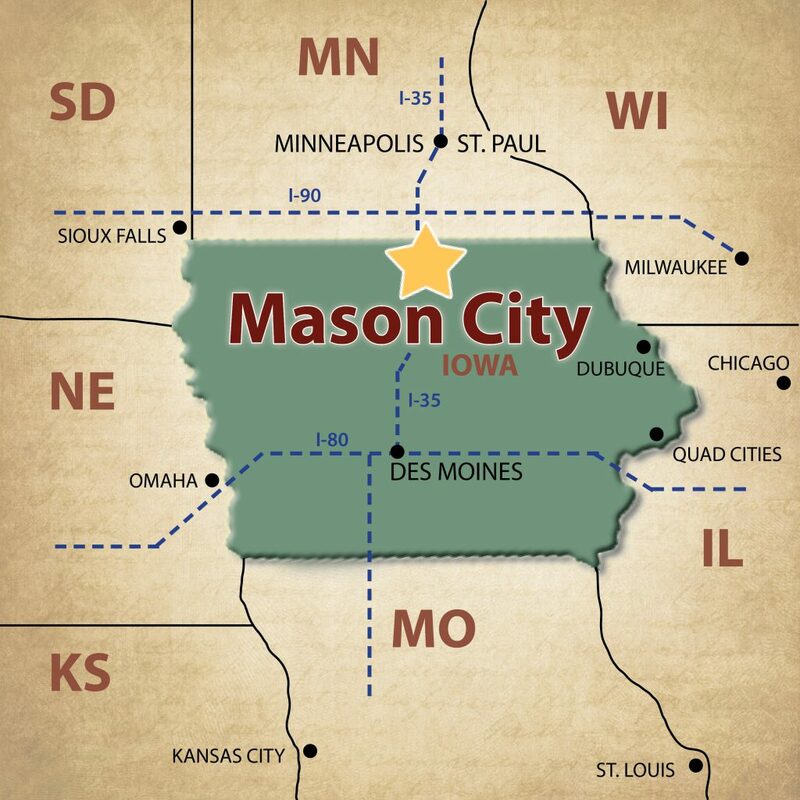 Located in North Central Iowa, Mason City is conveniently located halfway between Des Moines, Iowa and Minneapolis/St. Paul, Minnesota, just 8 miles east of Interstate 35. The Avenue of the Saints (Highway 18/US 27) is located just minutes South of City limits. The community has two main corridors – Highway 65 which runs north/south and Highway 122 which runs east/west; and connects the communities of Mason City and Clear Lake. The Mason City Municipal Airport is conveniently located between Mason City and Clear Lake (just 3 minutes off I-35), along Highway 122, and provides four commercial flights daily. Mason City is 45 minutes from Interstate 90 and 2 hours away from Interstate 80. In addition, Mason City is in close proximity to other larger metropolitan areas. PRINT-FRIENDLY VISITOR MAP: Mason City offers a variety of sightseeing opportunities, a vast trail system and a unique architectural/historical walking tour. This map identifies the major road routes within the community, the City’s all-purpose trail system, an enlarged downtown map featuring the Prairie School/Historical Architectural self-guided walking tour route and locators pinpointing the major areas of interest and lodging facilities. DOWNTOWN SHOPPING MAP: Features numerous shopping options in Mason City’s historic downtown with parking locations and time limits noted. DOWNTOWN DINING MAP: Highlights the variety of dining establishments located within the heart of Downtown Mason City. ARCHITECTURAL WALKING TOUR: Easy-to-use map leads visitor on a self-guided walking tour of the community’s architectural gems and historically significant buildings throughout the greater downtown Mason City area. SCULPTURE WALK: Self-guided tour starts in the Downtown and loops through the Cultural Crescent which is also home to many of the community’s historical architecture, Art Museum, public library, Music Man attractions and the unique artistic works of sculptors from around the country. MASON CITY BIKE TRAILS & CLEAR LAKE BIKE TRAILS: Enjoy multi-purpose trails located in and around Mason City and Clear Lake. NORTH IOWA SNOWMOBILE MAP: Highlights over 100 miles of snowmobile trails in the North Iowa area.